Very amazed. Went to Taranaki Patchworkers today to have a look at the shop Cushla's Village Fabrics. It was a wonderful selection of fabrics but only bought the one piece as on this bag. Marilyn and Jill then showed me the grocery bags that were covered in fabric do after a coffee with them I came home and made mine. Lots of fun stitching and making sure the colours looked okay I have made mine. What a wonderful day. 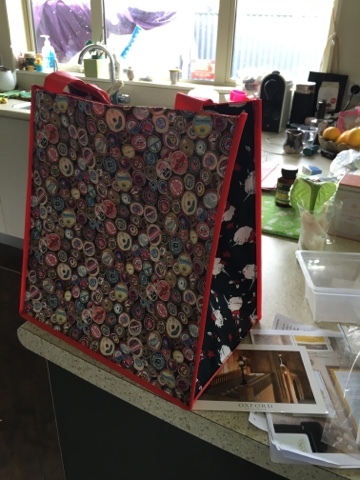 Finished two other projects today as well, hand towel for toilet and a snappy bag using a piece stitched at seminar two years ago. Is that a great postcard I spotted in the background?